RENPHO Smart Plug devotes to building smarter and better life. With simple plug and play installation and use, the smart wifi outlet can help switch on/off your electronic home appliances according to your needs with voice control or customize timing schedule. RENPHO Smart Plug would be your great life assistance, that helps to save your daily unncessary power consumption, and you can even have no worry about electricity safety when you're traveling. You can turn on/off connected devices wherever you are at any time anywhere! Such as air conditioner, thermostats, coffee makers, fans, water heater, TV, switches, garage doors, sprinklers, etc. Easy to Set Up ( Note: Set up "RENPHO Smart" APP first. 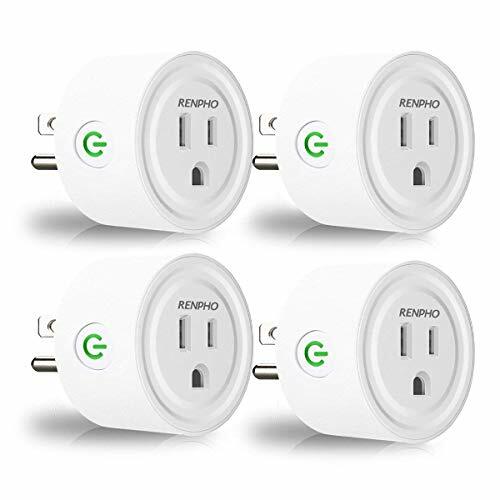 ), No Hub Required, RENPHO Mini Smart Plug works with your existing home Wi-Fi (2.4 GHz band) without the need for a separate hub. Step 3: Configure Smart Wi-Fi Plug preferences on the "RENPHO Smart" App. Step 4: Assign a name to each Smart Plug and communicate with each plug by name when making a voice command.